San Diego Humane Society's Petfinder adoption page is shown below. Click on any small photo to see a larger photo, and more information about the rabbit. You may sort the list by clicking any underlined column heading. Please contact SDHS directly to inquire about their adoptable rabbits. All rabbits listed are spayed or neutered, microchipped, and used to using a litter box. We HIGHLY recommend that you house your new rabbit indoors. Rabbits are prey animals and San Diego County is home to many predator animals such as hawks, owls, coyotes, raccoons, foxes and bob cats, all of which kill small animals left outside (even rabbits kept in a cage or hutch). Wet or hot weather and parasites such as fleas, flies, and mosquitoes also can be deadly to rabbits. 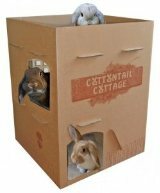 You can easily house your rabbit indoors and make him a part of your family. He will live a much longer and healthier life, and you will enjoy him so much more. Learn more about housing your bunny indoors. Also visit the page for San Diego Humane Society - Gaines Campus for more rabbits available for adoption.